Culture forms community and can spring from a bond as normal as that of man and dog. 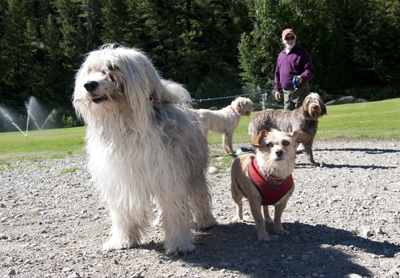 The dog park, located at the former Warm Springs Ranch property, is a new opportunity for enjoyment in 21st century Ketchum. The park’s place is on Warm Springs Road (just turn toward Baldy on Bald Mountain Drive). It’s a peculiar example of a community that arose out of nothing. It’s a place where multiple generations, several activities, laughter and woofs come together. In the winter, snowshoe trails build themselves through footsteps and footprints. In the summer, it’s just plain fun under Sun Valley sun. And everybody engages with everybody. It’s a healthy scene, a natural one. But, as much as the culture pressures a “leave no trace philosophy,” there is still a bit of organic matter. It’s a state of enjoyment born from a ghost ranch of the past with now tree-root-ripped tennis courts. And a river runs through it. Some scenes, issues, creatures and people may not be as mutually exclusive as it might appear. On Tuesday, Diana Dudley was walking Archie (a King Charles spaniel) and two pups, Molly (a golden retriever) and Toby (an Irish setter, which Dudley said is a rare breed in the valley). Ketchum’s Parks and Recreation Director Jennifer Smith said she enjoys the scene at the dog park. “But it has nothing to do with the city’s parks department,” she said. It’s a bootstrap effort in a town full of hiking and ski boots.